PLEASE NOTE THAT EXTRA WAX WAS MELTED TO USE AS AN “ADHESIVE” TO ATTACH THE CANDLE TO THE CARDBOARD BASE IN BOTTOM OF BOX. THE CANDLE ITSELF WAS NOT MELTED TO MAKE THIS “ADHESIVE”. THIS VINTAGE GURLEY CANDLE HAS SO MUCH DETAIL – IT’S ROSE SHAPED AND IS IN TWO COLORS! CANDLE MEASURES 2 1/2” TALL AND IS 3 3/8” WIDE AT TOP. IT HAS PINK OUTER PETALS WITH RED INNER PETALS. I HAVE SUCH A LARGE NUMBER OF CANDLES TO LIST THAT I DID NOT SPEND ANY TIME CLEANING THEM. THIS ONE HAS SOME SMUDGES THAT I THINK WILL WIPE OFF WITH A DAMP CLOTH. CANDLES MEASURE 2 3/4" TALL. THEY HAVE LOST THE GURLEY CARDBOARD BASES/LABELS AND THEY HAVE SOME STORAGE EVIDENCE. THEY ARE VERY NICE CANDLES AND ARE NOT YOUR EVERYDAY FINDS. 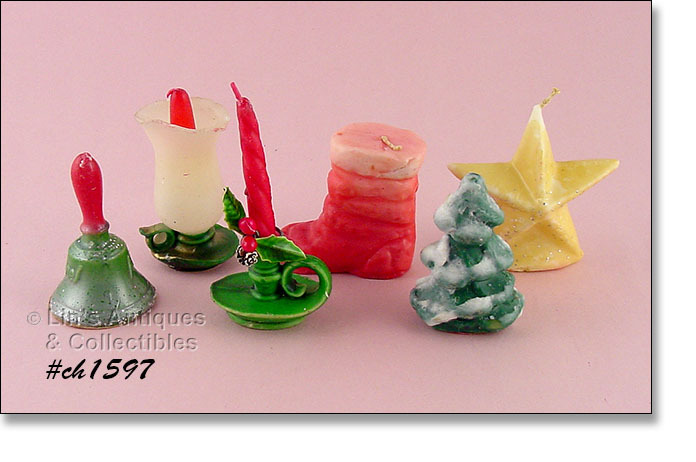 THESE VINTAGE GURLEY CANDLES ARE CUTE AND COLORFUL! THEY ARE SHAPED LIKE JACK-O-LANTERNS “WEARING” WIZARD HATS. CANDLES MEASURE 3 3/4" TALL. 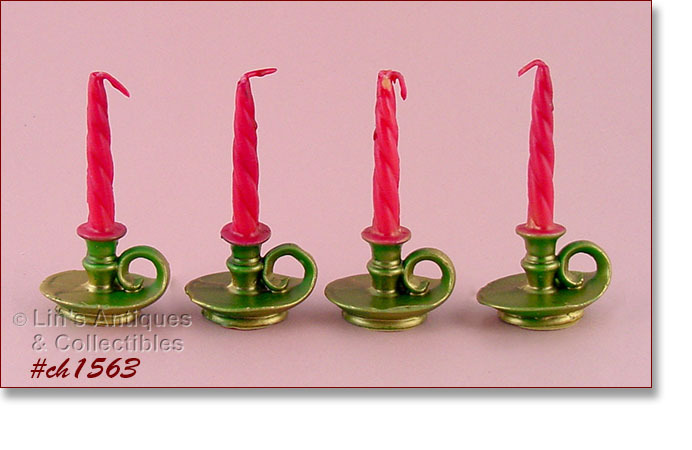 CANDLES MEASURE 3” TALL AND ARE IN VERY GOOD VINTAGE CONDITION. THEY HAVE MINOR STORAGE EVIDENCE. ONE HAS THE ORIGINAL GURLEY BASE/LABEL, THE OTHER DOES NOT. I HAVE ANOTHER OF THESE CANDLES EXCEPT THIS ONE DOESN’T HAVE A BOX AND HIS JACK-O-LANTERN MOUTH HAS RECEIVED SOME DAMAGE. I WOULD SURMISE IT WAS DROPPED. IT WILL BE INCLUDED AT NO CHARGE IF YOU WOULD LIKE TO HAVE IT! 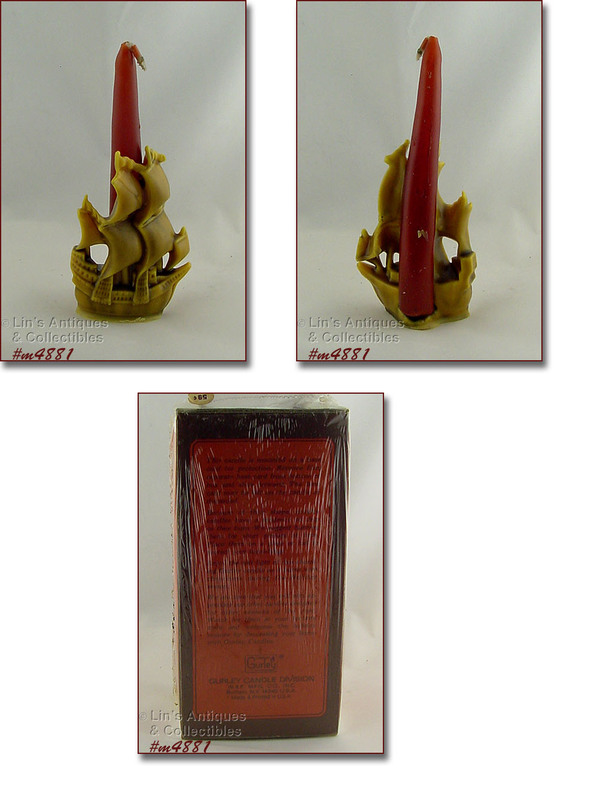 THIS IS ONE OF THE MORE UNUSUAL GURLEY CANDLES THAT I HAVE SEEN – IT’S SHAPED LIKE A SAILING SHIP! CANDLE MEASURES 6” TALL (AT TALLEST) AND IS IN THE ORIGINAL BOX. I OPENED THE CELLOPHANE COVERING ON THIS ONE SO WE COULD TAKE PHOTOS. 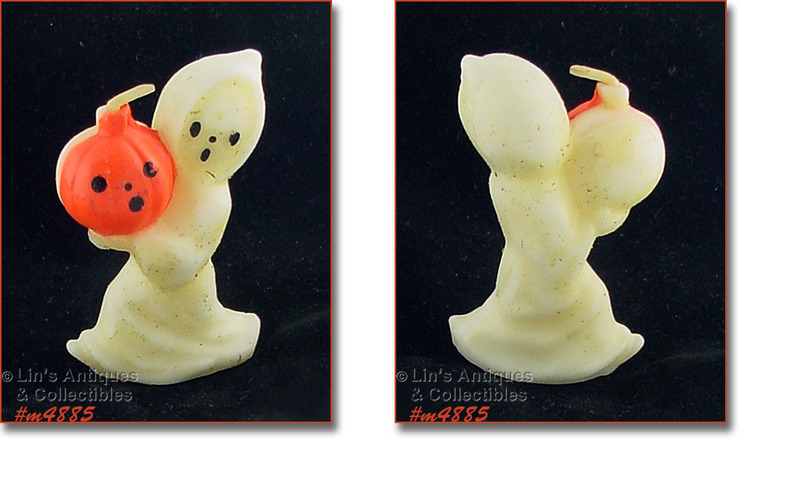 THIS LISTING HAS ANOTHER VINTAGE AND UNUSUAL GURLEY HALLOWEEN CANDLE – IT’S A GHOST HOLDING A PUMPKIN! THE GHOST MEASURES 7 1/4" TALL AND IN THE ORIGINAL BOX. THE BOX HAS SOME STORAGE “SQUISHING”. I OPENED THE CELLOPHANE ON THIS ONE IN ORDER TO REMOVE THE CANDLE FOR PHOTOS. 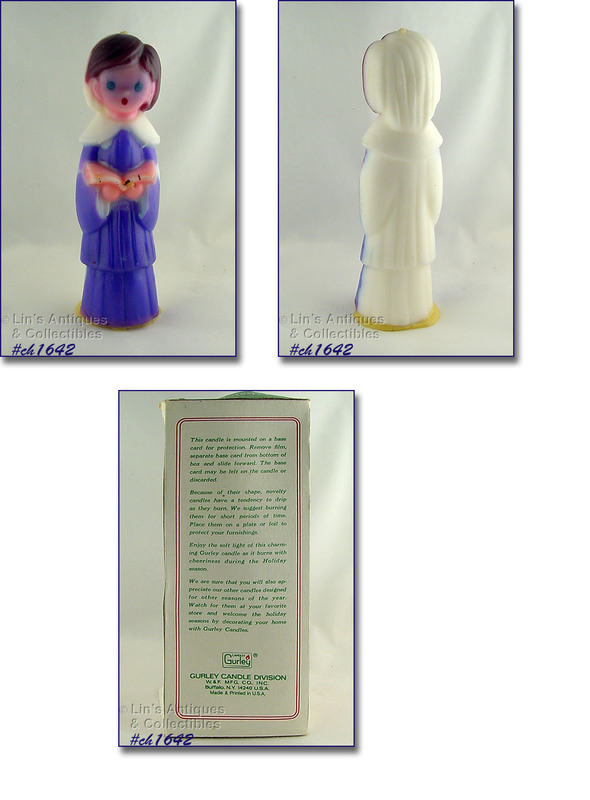 CANDLE IS IN WONDERFUL VINTAGE CONDITION AND IS A SUPER ADDITION TO A GURLEY CANDLE COLLECTION. THIS GURLEY CANDLE LISTING IS A VERY UNUSUAL CANDLE. IT’S A SKELETON IN A COFFIN! THE CANDLE MEASURES 7 3/4" X 2 1/2" X 1 3/8”. IT IS IN THE ORIGINAL BOX THAT HAS SOME STORAGE “SQUISHING”. 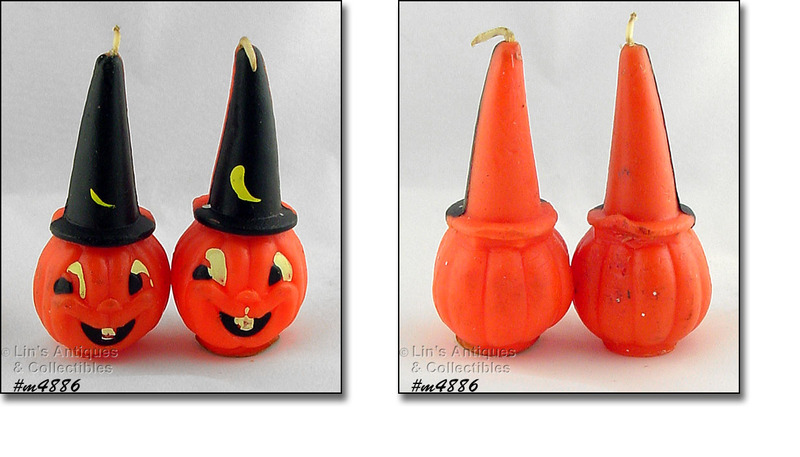 THIS VINTAGE GURLEY CANDLE LISTING HAS A PUMPKIN HEAD SCARECROW! CANDLE MEASURES 7 1/2” TALL. MR. SCARECROW IS IN THE ORIGINAL BOX THAT HAS STORAGE “SQUISHING”. THE CELLOPHANE IS MISSING BECAUSE IT HAD TO BE OPENED AND/OR REMOVED TO ACCESS THE CANDLE. FOR WHATEVER REASON, THE PURPLE COLOR ON THIS CANDLE WILL FADE ONTO YOUR HANDS – SO PLEASE DO NOT PLACE IT ANYWHERE WITHOUT PUTTING A PIECE OF CARDBOARD OR THE BASE CARD (INSIDE THE BOX) UNDER IT. 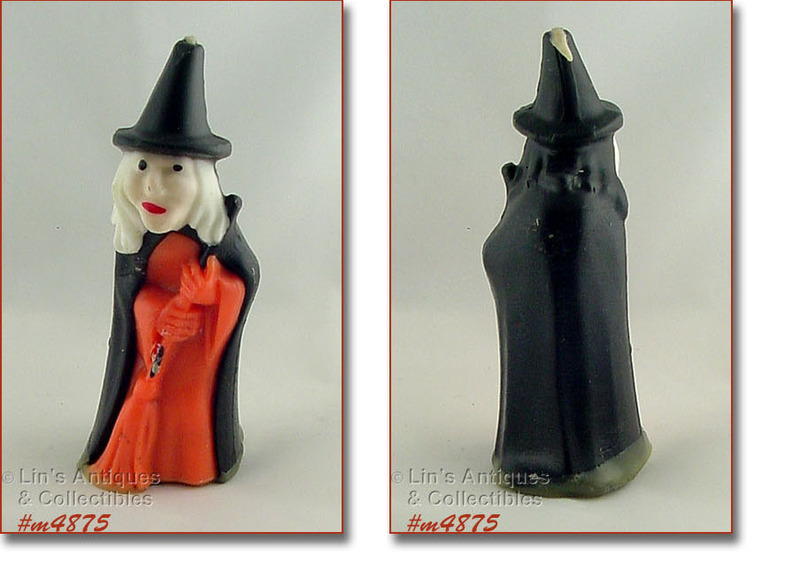 THIS LISTING HAS A VINTAGE WITCH CANDLE MADE BY GURLEY CANDLE COMPANY! 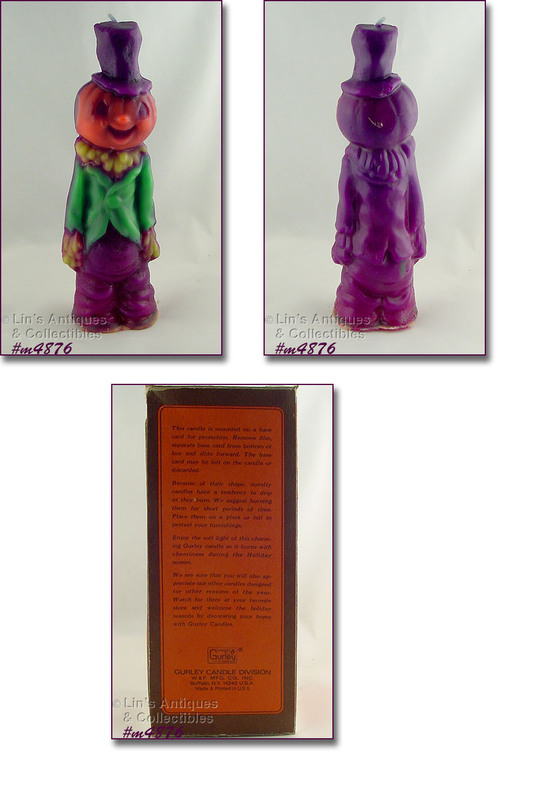 SHE MEASURES 5 1/2” TALL AND IS IN WONDERFUL VINTAGE CONDITION WITH MINOR STORAGE EVIDENCE. IT HAS NOT BEEN BURNED NOR HAS THE WICK BEEN LIT. THE WITCH IS IN THE ORIGINAL BOX – THE BOX IS A LITTLE SQUISHED. THE CELLOPHANE IS TORN AND/OR MISSING BECAUSE IT HAD TO BE OPENED AND/OR REMOVED TO ACCESS THE CANDLE. PLEASE NOTE THAT EXTRA WAX WAS MELTED TO USE AS AN “ADHESIVE” TO ATTACH THE CANDLE TO THE CARDBOARD BASE IN BOTTOM OF BOX. THE CANDLE ITSELF WAS NOT MELTED TO MAKE THIS “ADHESIVE”. THIS CANDLE HAS SOME OF THAT WAX ON THE BASE – IT IS EASILY REMOVED IF YOU SO CHOOSE. THIS LISTING HAS A VINTAGE GURLEY CANDLE IN EXCELLENT CONDITION! CANDLE IS A CHOIR GIRL AND SHE MEASURES 7 ½” TALL. CANDLE IS IN WONDERFUL VINTAGE CONDITION AND IS A SUPER ADDITION TO A GURLEY CANDLE COLLECTION OR A VINTAGE CHRISTMAS COLLECTION. THIS LISTING HAS AN EXCELLENT CONDITION VINTAGE GURLEY CANDLE! 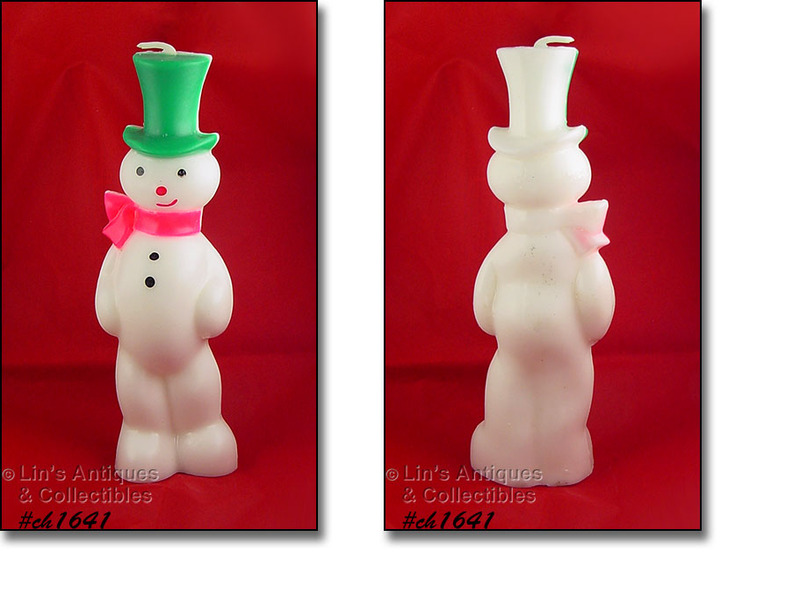 CANDLE IS A SNOWMAN “WEARING” A TOP HAT. SNOWMAN MEASURES 7 ½” TALL. CANDLE IS A SUPER ADDITION TO A GURLEY CANDLE COLLECTION OR A VINTAGE CHRISTMAS COLLECTION. 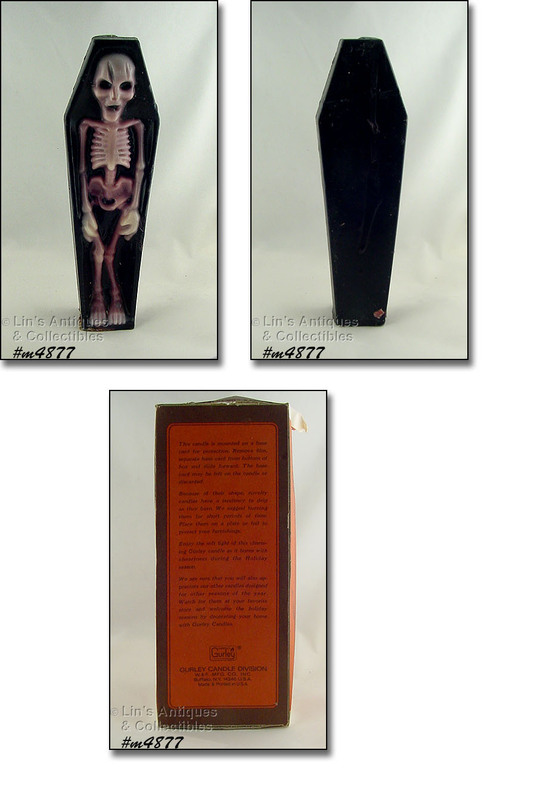 THIS LISTING HAS A PAIR OF VERY UNUSUAL VINTAGE GURLEY CANDLES! CANDLES MEASURE 10” TALL. THEY ARE OF A SANTA HEAD “WEARING” A VERY TALL HAT. CANDLES ARE IN WONDERFUL VINTAGE CONDITION AND ARE A SUPER ADDITION TO A GURLEY CANDLE COLLECTION OR A VINTAGE CHRISTMAS COLLECTION. THESE LITTLE CANDLES ARE NOT PERFECT BUT ARE DIFFICULT TO FIND SO I PURCHASED THEM! 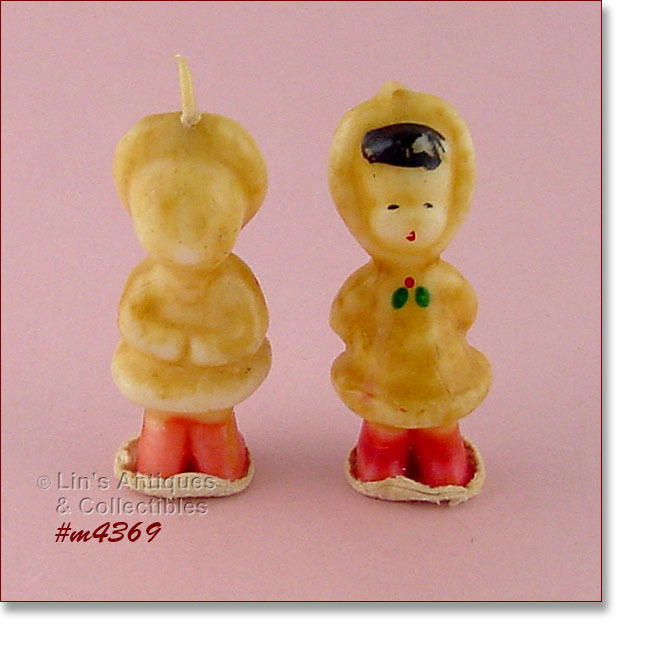 THESE ARE ESKIMO CHILDREN, MEASURE 2 ¾” TALL, AND HAVE THEIR ORIGINAL CARDBOARD BASES/LABELS. THEY HAVE MINOR STORAGE EVIDENCE AND HAVE YELLOWED/DISCOLORED. THIS LISTING HAS TWO GURLEY BUNNY SHAPED CANDLES! THEY MEASURE 3” TALL AND HAVE THE ORIGINAL GURLEY CARDBOARD BASES/LABELS. 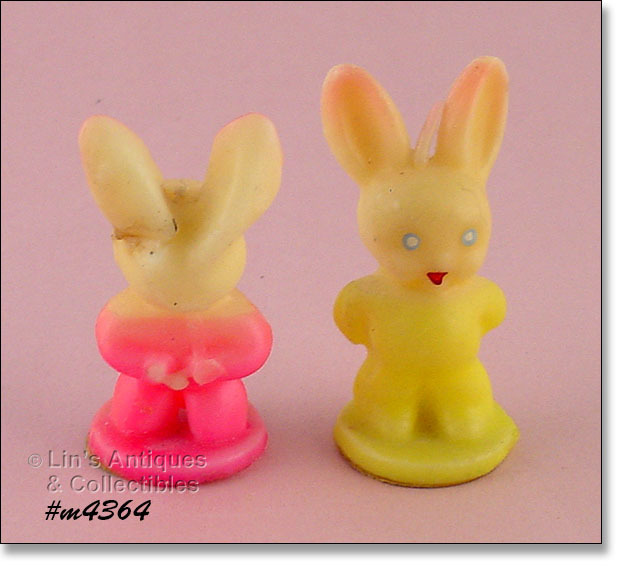 THE PINK BUNNY HAS HAD A BROKEN EAR (REPAIRED) AND IS INCLUDED AT NO CHARGE – PRICING IS BASE ON ONE BUNNY CANDLE. ANOTHER REALLY NEAT GURLEY CANDLE LISTING! 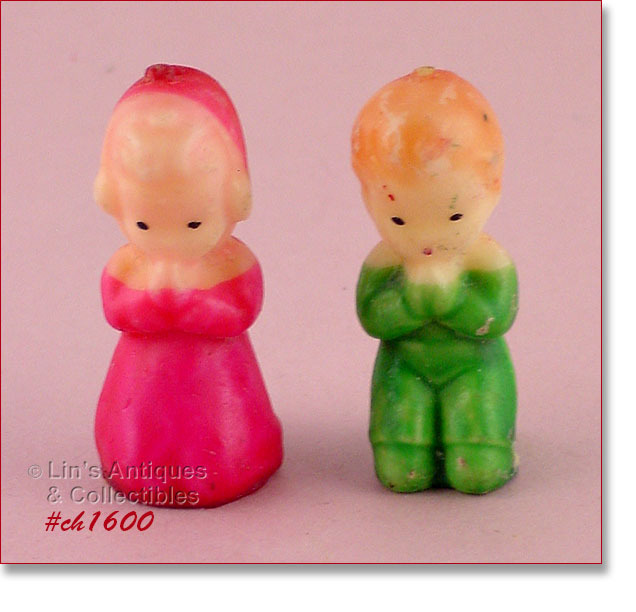 THIS ONE HAS PRAYING BOY AND GIRL. MEASURE 2 ¼” TALL AND BOTH HAVE LOST THEIR ORIGINAL GURLEY CARDBOARD BASES/LABELS. 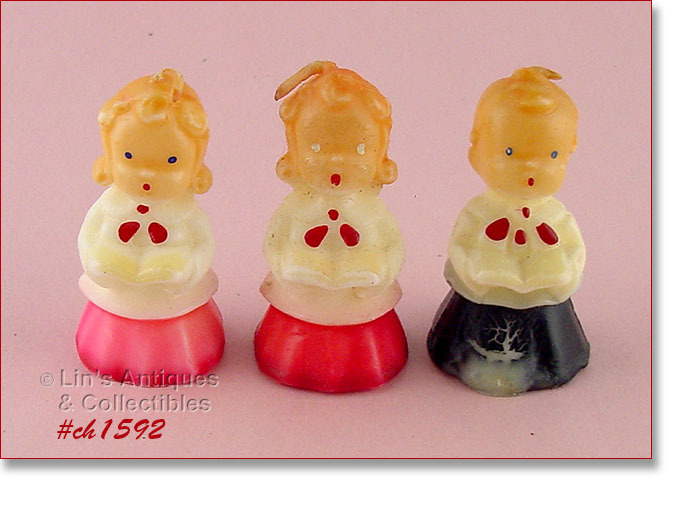 THIS GURLEY GROUPING HAS AGE YELLOWING/DISCOLORATION – THERE’S AN ANGEL AND 2 LITTLE LAMBS! ANOTHER REALLY NEAT GURLEY CANDLE! THIS ONE IS AN ANGEL SLEEPING ON A CRESCENT MOON. CANDLE HAS SOME STORAGE EVIDENCE. BOTTOM HAS ORIGINAL GURLEY CARDBOARD BASE/LABEL. THIS IS A NEAT CANDLE GROUPING! THERE ARE 6 CANDLES – THE SANTA BOOT IS PROBABLY GURLEY BUT DOES NOT HAVE LABEL, THE STAR IS ALSO PROBABLY GURLEY BUT ONLY HAS 10 CENT PRICE STICKER ON BOTTOM, THE TREE IS WAYSIDE AND HAS LABEL, THE CANDLE LAMP IS GURLEY (WITH CARDBOARD BASE/LABEL), THE NOEL BELL IS GURLEY (WITH CARDBOARD BASE/LABEL), AND THE CHAMBER STICK STYLE CANDLE IS GURLEY (WITHOUT BASE/LABEL). NICE ASSORTMENT OF CANDLES, NICELY PRICED! 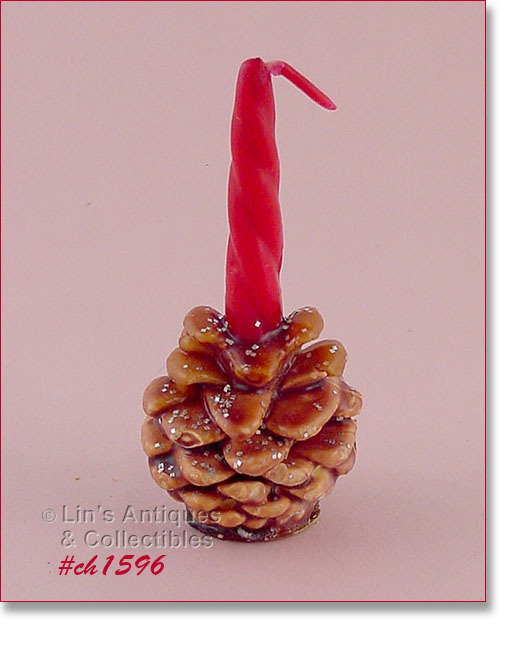 ANOTHER NEAT GURLEY CANDLE – THIS ONE IS SHAPED LIKE A CANDLE ON A PINECONE! MEASURES 4 1/8” TALL AND HAS THE ORIGINAL GURLEY CARDBOARD BASE/LABEL. THIS IS AN UNUSUAL GURLEY CANDLE! 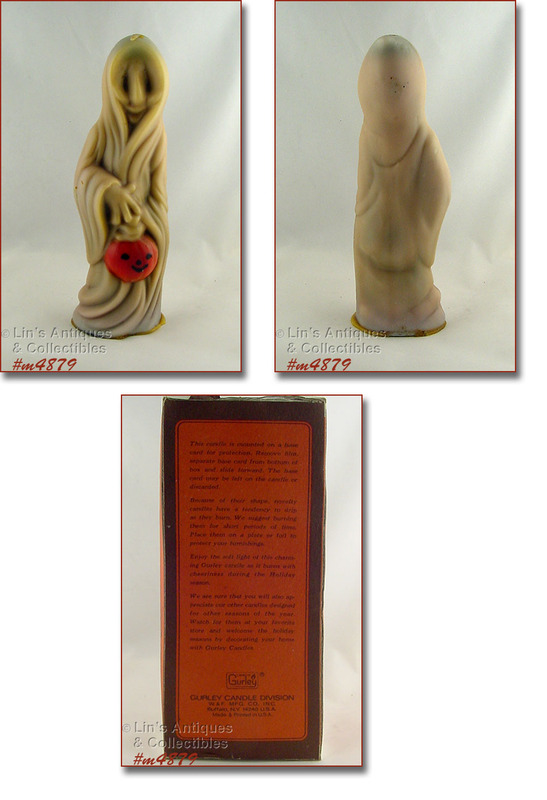 IT’S SHAPED LIKE A CHAMBERSTICK STYLE CANDLE WITH A LITTLE GRAY MOUSE CURLED UP ON THE BASE. MEASURES 3 ½” TALL AND STILL HAS THE ORIGINAL GURLEY CARDBOARD BASE/LABEL. CANDLE APPEARS TO HAVE OVERHEATED DURING STORAGE BUT IT’S STILL CUTE AS IS! THIS LISTING HAS 2 NEAT CANDLES! ONE IS A GURLEY WITH CARDBOARD BASE/LABEL AND IS SANTA SITTING ON A PACKAGE. MEASURES 3 ¼” TALL AND IS IN VERY GOOD CONDITION WITH MINOR STORAGE EVIDENCE. 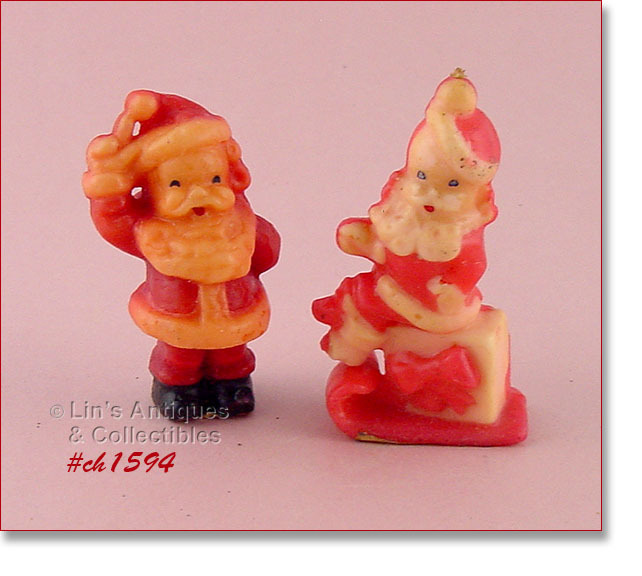 THE OTHER ONE IS A WAVING SANTA, MEASURES 3” TALL, AND BASED ON THE COLORING AND SHAPE, I BELIEVE HE IS A TAVERN COMPANY PRODUCTION (DOES NOT HAVE ORIGINAL CARDBOARD LABEL/BASE). NEAT CANDLES! 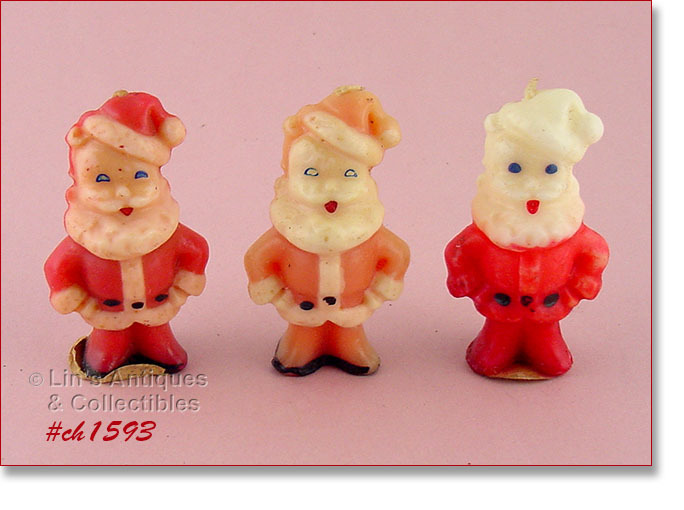 I’VE GROUPED THESE 3 GURLEY SANTA SHAPED CANDLES INTO ONE LISTING! THEY MEASURE 3 ¼” TALL AND AS CAN BE SEEN IN PHOTO, THEY ARE EACH A LITTLE DIFFERENT. ONE IS VERY PALE RED (FRONT AND BACK), THE OTHER IS A MEDIUM COLOR RED, AND ONE IS BRIGHT RED WITH THE DIFFICULT TO FIND WHITE HAT. TWO HAVE THE ORIGINAL GURLEY CARDBOARD BASES/LABELS AND EACH HAS MINOR STORAGE EVIDENCE. THERE ARE 2 LITTLE GURLEY CHOIRGIRLS IN THIS LISTING AND A FREE CHOIRBOY! THE GIRLS MEASURE 2 /34” TALL AND HAVE LOST THEIR ORIGINAL GURLEY CARDBOARD BASES/LABELS. THEY ARE IN WONDERFUL CONDITION WITH MINOR STORAGE EVIDENCE. 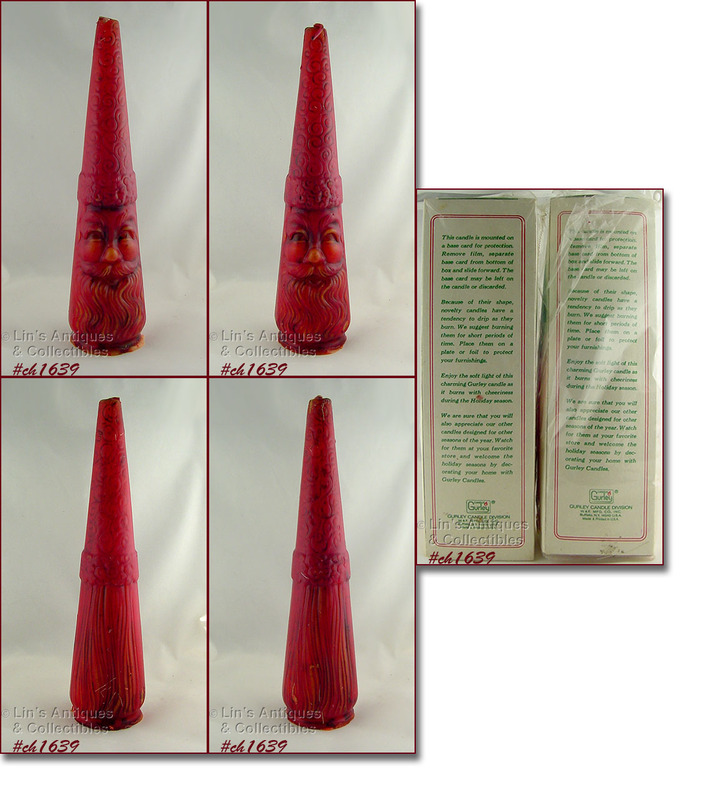 THE LITTLE BOY CANDLE MEASURES 2 ¾” TALL, HAS THE ORIGINAL GURLEY CARDBOARD LABEL/BASE, AND IS INCLUDED AT NO CHARGE BECAUSE HE HAS BEEN HEATED – SEE LITTLE WAX POOL AT BOTTOM FRONT. 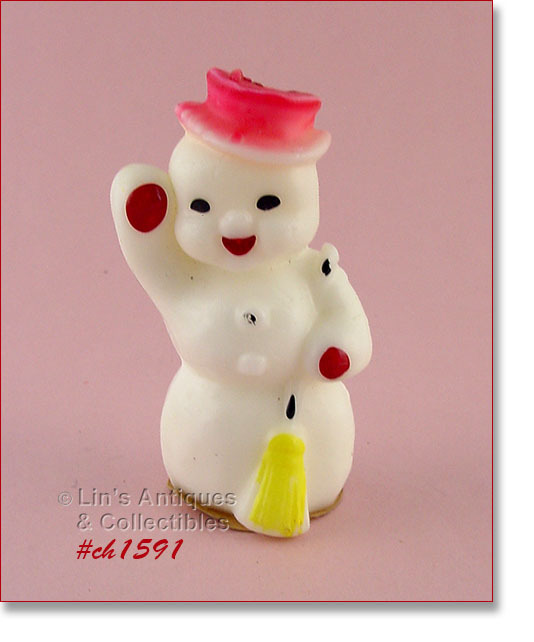 THIS GURLEY LISTING HAS A LARGE SNOWMAN CANDLE! HE MEASURES 5” TALL AND HAS THE ORIGINAL GURLEY CARDBOARD BASE/LABEL. HE’S IN SUPER CONDITION WITH MINOR STORAGE EVIDENCE BUT NO DISCOLORATION!! 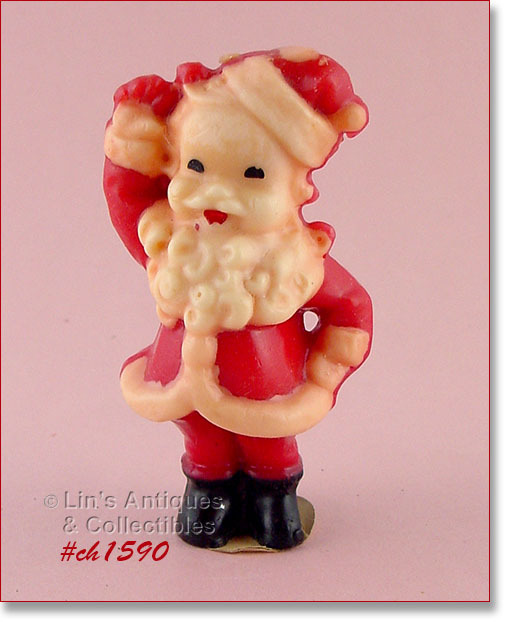 SUPER CONDITION SANTA SHAPED CANDLE MADE BY GURLEY CANDLE COMPANY! HE MEASURES 5 1/8” TALL AND STILL HAS HIS ORIGINAL GURLEY CARDBOARD BASE/LABEL. NEAT! ANOTHER NEAT GURLEY CANDLE! 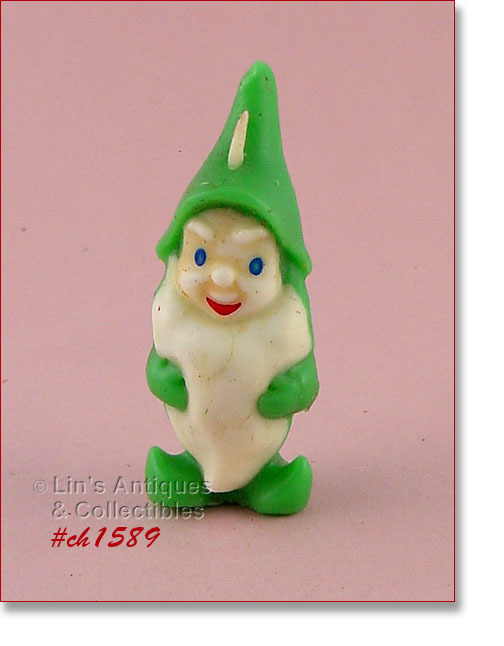 THIS ONE IS A GNOME (OR ONE OF THE SEVEN DWARFS) AND HE’S “DRESSED” IN GREEN. 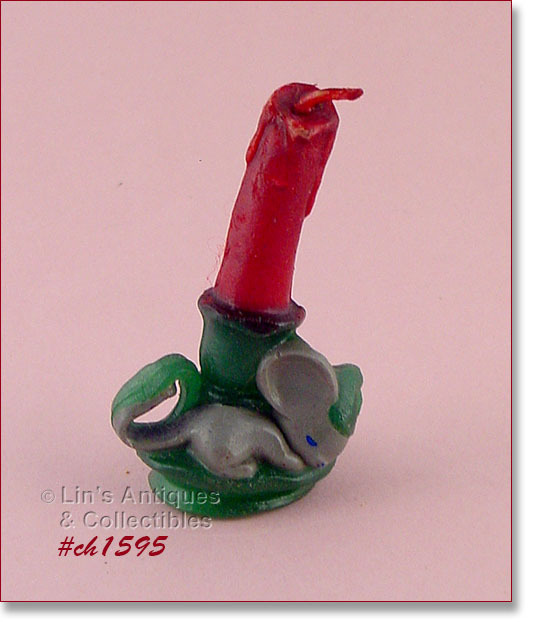 CANDLE MEASURES A LITTLE OVER 3 ½” TALL AND HAS LOST HIS GURLEY CARDBOARD LABEL/BASE. CANDLE IS IN VERY GOOD CONDITION WITH MINOR STORAGE EVIDENCE. 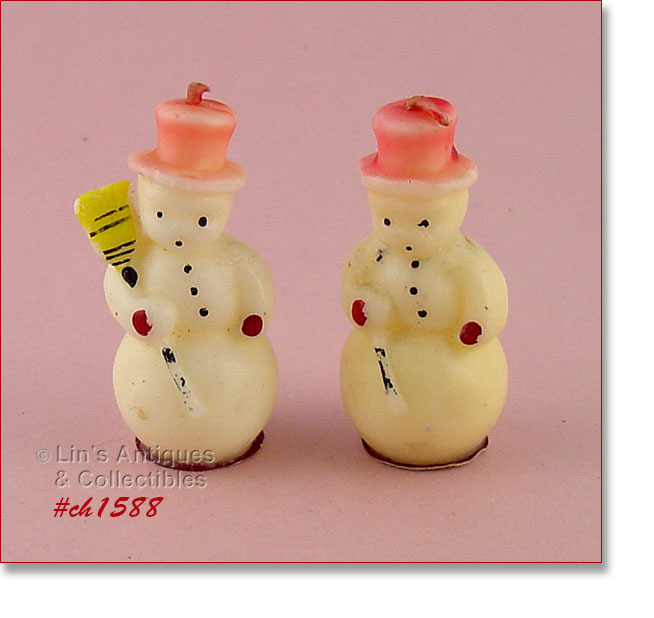 THIS LISTING HAS 2 SMALL SNOWMEN CANDLES BY THE TAVERN CANDLE COMPANY! THEY MEASURE 2 ½” TALL AND STILL HAVE THE ORIGINAL CARDBOARD BASES/LABELS. ONE CANDLE IS PERFECT (THE RED COLOR OF HIS HAT HAS FADED) AND THE PRICE IS FOR THIS CANDLE. 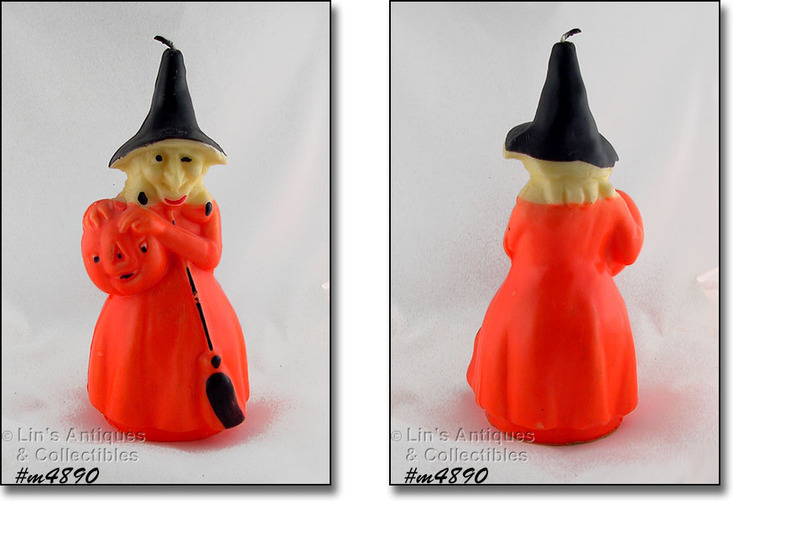 THE OTHER ONE HAS STORAGE DAMAGE – HIS NECK IS BROKEN (CAN BE FIXED BY HEATING/WARMING THE WAX) AND THE “BROOM” IS MISSING FROM THE HANDLE – THIS CANDLE IS INCLUDED AT NO CHARGE. 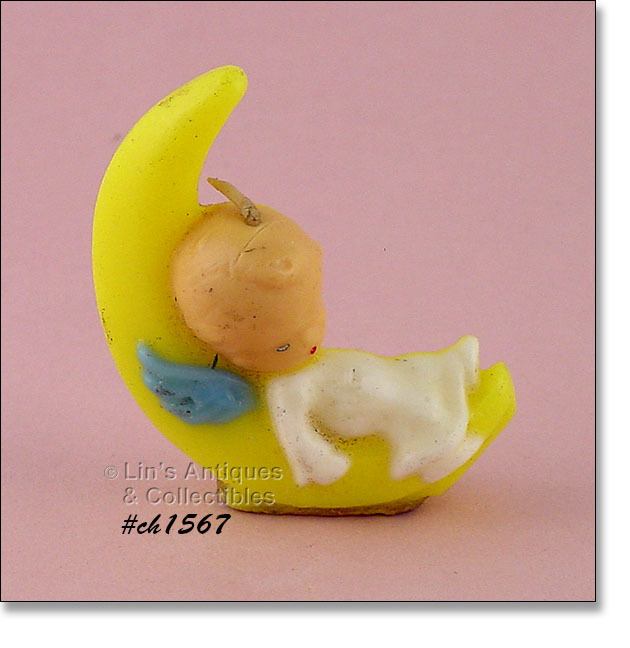 NEAT GURLEY CANDLE – THIS ONE IS A BABY ANGEL ASLEEP ON A CRESCENT MOON! HAS SOME STORAGE EVIDENCE (SEE PHOTO). THIS LISTING HAS THREE GURLEY CHOIRBOY CANDLES! THEY MEASURE 2 ¾” TALL AND TWO HAVE LOST THEIR ORIGINAL GURLEY CARDBOARD BASES/LABELS. 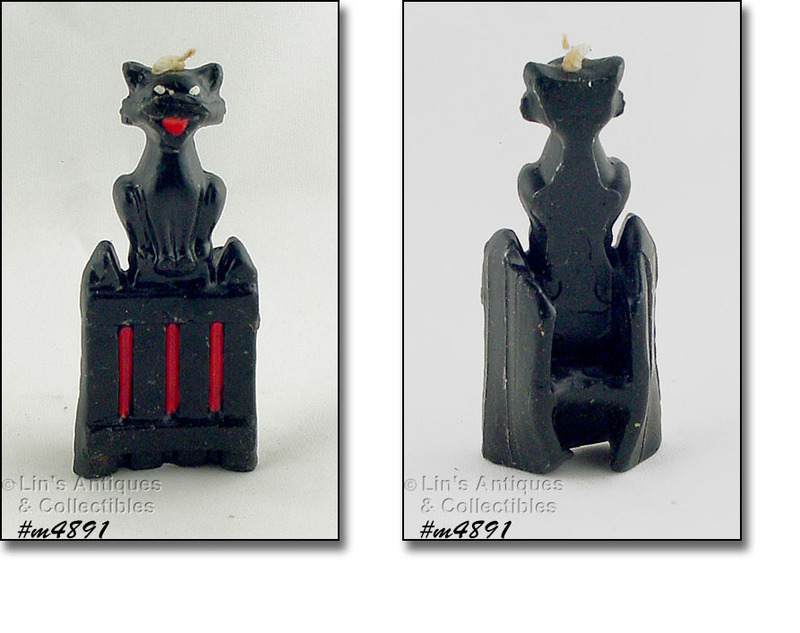 CANDLES ARE THE MORE DIFFICULT TO FIND BLACK CANDLES AND ARE IN VERY GOOD CONDITION WITH MINOR STORAGE EVIDENCE. I’VE GROUPED THESE 4 GURLEY CANDLES INTO ONE LISTING! 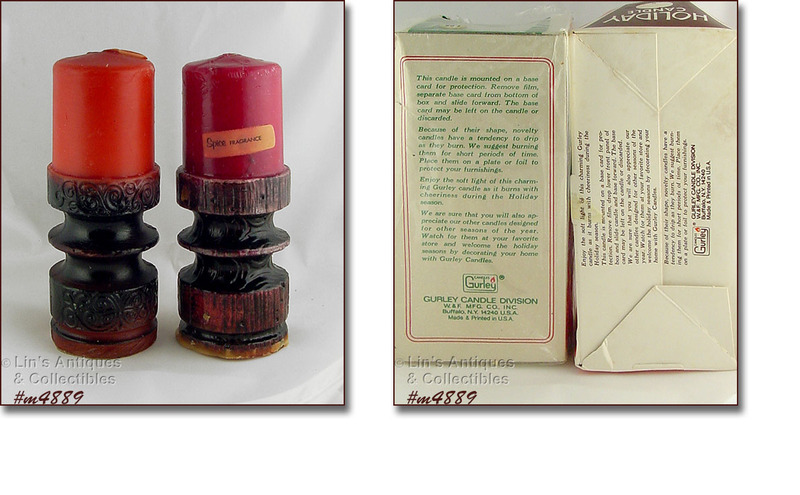 THEY ARE CHAMBER STICK STYLE CANDLES, MEASURE 4 ½” TALL, AND HAVE THE ORIGINAL GURLEY CARDBOARD LABELS/BASES. THEY ARE IN SUPER CONDITION WITH MINOR STORAGE EVIDENCE – MISSING COLOR SPOTS AND ONE IS A LITTLE CROOKED – THAT’S IT! NEAT CANDLES. NEAT GURLEY PILGRIM BOY AND GIRL CANDLES! LITTLE BOY IS 3 ¼” TALL, GIRL IS 2 ¾” AND BOTH HAVE THE ORIGINAL GURLEY CARDBOARD LABELS/BASES. THEY HAVE SOME STORAGE EVIDENCE, NOTHING SERIOUS – SEE PHOTO. 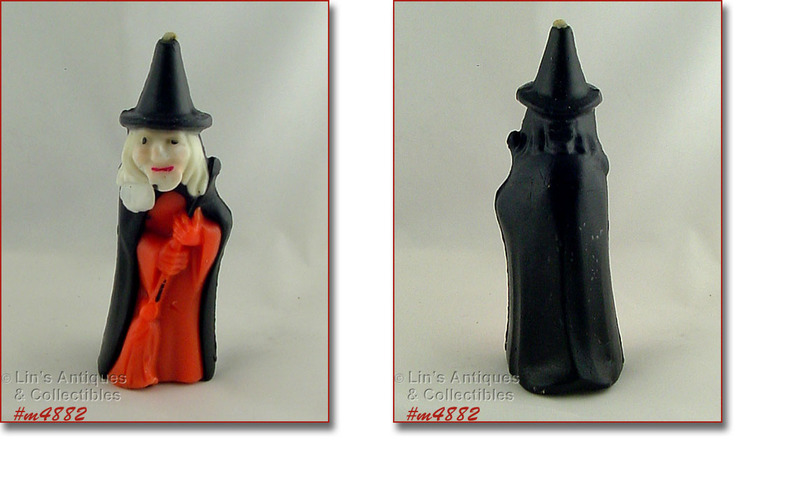 I’VE GROUPED 3 GURLEY HALLOWEEN CANDLES INTO THIS LISTING! 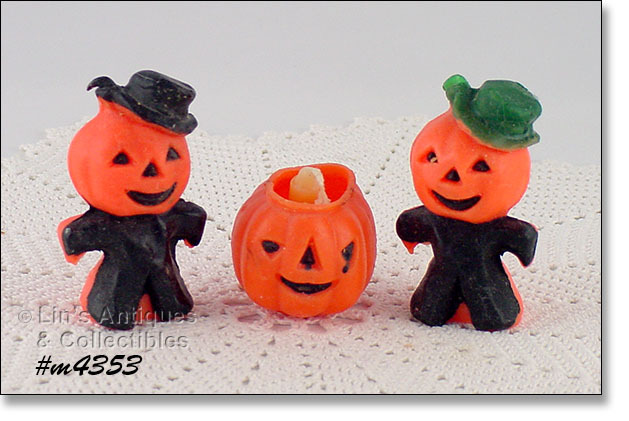 THERE ARE TWO PUMPKIN HEAD MEN AND A JACK-O-LANTERN WITH A CENTER CANDLE. 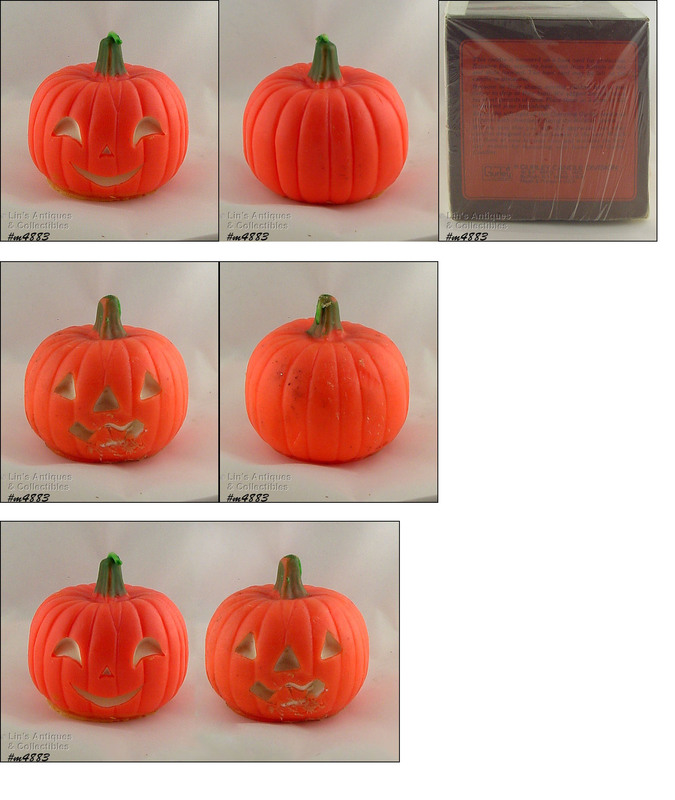 THE PUMPKIN HEADS MEASURE 3 1/8” TALL, THE JACK-O-LANTERN IS 2” TALL (AT TALLEST). 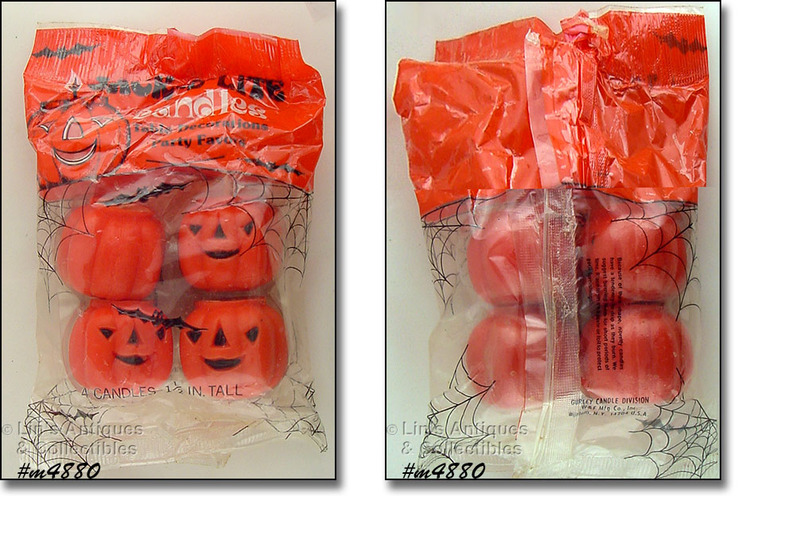 ALL 3 NO LONGER HAVE THE GURLEY CARDBOARD LABELS/BASES AND THEY DO HAVE SOME STORAGE EVIDENCE WITH THE JACK-O-LANTERN BEING A LITTLE SMOOSHED. NICE CANDLES, NICELY PRICED!